Under the umbrella of the OpenMed project, Cadi Ayyad University, in collaboration with Ibn Zohr University, organises the 2nd Open Education Days on January 22-24, 2018 (OED’2018) in Marrakech. These days will bring together experts, researchers and professionals representing several national and international partners who will debate the production of Open Educational Resources (OER) and the adoption of Open Educational Practices (OEP) and present the latest research in the field. 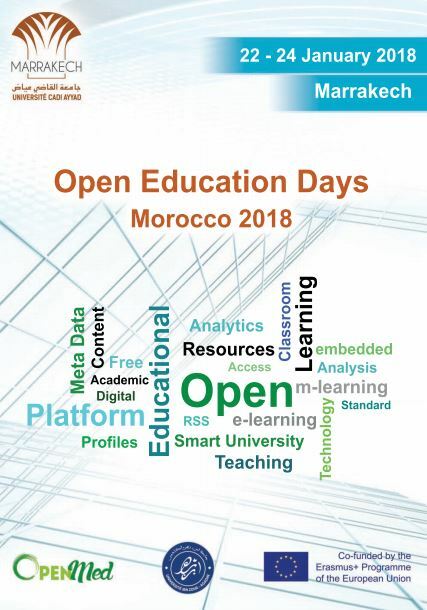 OED’2018 follows the OER Morocco Declaration, launched in December 2016 in Marrakech at UCA during the first Open Education Day.